It's Derby season in Louisville! Here's your expected-and-necessary version of "My Old Kentucky Home," this time performed on the musical saw and the banjo. I love that Steve Cooley, who is always up for recording my antics. Today's blog is about self-employed ROUTINE. I'm finding this difficult. I'm settling in to having childcare and not having to panic-call any babysitters for a business meeting or rehearsal. Still, I can't seem to find a good routine of balancing admin work with creative work. Has anyone out there managed it? Would you share your tips? Or guest-blog for me? I'm hoping to spend some of today developing a regular schedule. I'm also trying to remember all the self-employed tips I've published in the past -- and referring to my own blog posts for inspiration. It reminds me that once upon a time, I was very good at this balance! Live-in childcare magic & practicing my business. our amazing au pair made last week. A few weeks ago at the school fundraiser, I was talking to a parent who was struggling with childcare, and I said, "What you need to get is a Brazilian!" Then she looked at me in horror, and I realized that I was inadvertently sexually harassing her when really I just meant that we have a Brazilian au pair whom we absolutely adore. 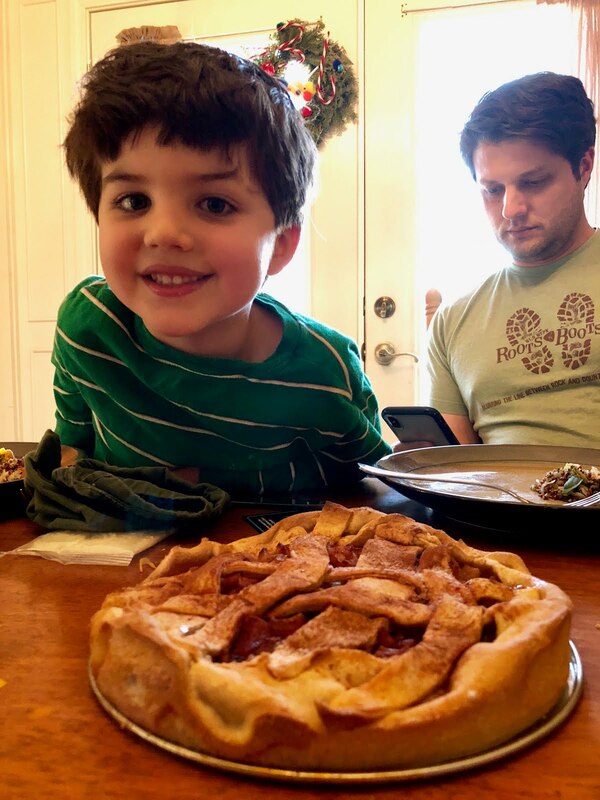 Lots of you have been asking me "how the au pair thing is going," and I'm here to say that it's going really, really well! I am slowly, but steadily, coming up for air. The first day she was on duty, I sorted a ton of gigs and contracts, and now I'm actually making time for something I haven't had *any* time for in the past five years: practice. Playing notes has never been a problem for me, but I've noticed a slip in my soloing capabilities lately -- entirely because the only time I ever actually get to play music is when I'm gigging. It's frustrating when your head has the solo idea, but your fingers won't cooperate because arthritis, tendonitis, non-practicitis. This week, I practiced scales and Hanon virtuosos piano exercises at least 30 minutes a day, which is not a huge number (I think it's a bare minimum for maintenance to be honest), but it's more than I've had in ages. So, yes, "the au pair thing," is going well. I love being able to take a phone call or have a rehearsal or do my bookkeeping at normal business hours rather than relying completely when the kids are not chewing on my feet. I love being able to play a gig on a Wednesday night and not scramble to find childcare. I love that the kids have another constant adult in their lives who is capable of doing bedtime when that is notoriously challenging for my children. She's the kindest person I've ever met, and she loves to cook and bake with the kids, and she even makes me coffee when she's the first one downstairs in the morning. It's like having an amazing and thoughtful roommate. My biggest challenge has been trying to ignore the haters -- and there have been a surprising number of them. Maybe you, my reader, are one of the haters too, rolling your eyes and thinking how bourgeois it is to have an au pair. If that is you, then I ask you if you also roll your eyes at yourself when you take your child to daycare so you can work? Or at your friends who work 9-5 jobs but have childcare? Because this "au pair thing" is so that I can work, not because I'm bored and wealthy (but even if that were the case, then MOVE ON, FOLKS!). Ok, enough justifying. And enough blogging. Back to songwriting. And tour booking. But not back to sorting childcare because, guess what? I got a Brazilian! I've been digging through a notebook of half-written songs and thinking it's time to record them and move on. Steve Cooley, can we get started on that next record already??? Interested in hiring an au pair? Here's a referral link to the agency we used. ERs & IKEA retail therapy. 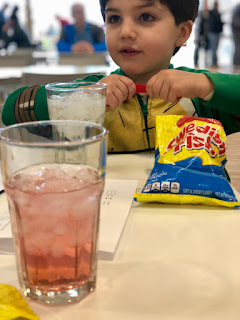 IKEA lingonberry juice and Swedish fish. I posted this carefree blog last Monday, and then Tuesday was one of those real adulting days when I had to rush my 2-year-old to the ER via ambulance, with apparently no time to even transfer the carseat. He went from 100% fine to gasping from The Croup in about 5 minutes, and it was the Immediate Care Center that called EMS. Poor little guy was fine after a few breathing treatments and steroids, but not without scaring everyone. David drove straight home from Wisconsin after the paramedic told me to call him. It was no fun flying solo in the ER, but I abandoned our amazing au pair at home by herself (Graham was having a sleepover with my parents) because I was so focused on Angus I didn't want to worry about anyone else. This weekend -- after the strange few days of monitoring Angus's every breath -- we escaped to IKEA land, aka West Chester, Ohio, for some Retail Therapy. It seemed like a weird, fun thing to our Brazilian au pair, who had not heard of IKEA, and it's been so cold she's been trapped in our house anyway. So we hit suburban Ohio (insert laughing hysterical emoji). We have been keeping a secret IKEA list for years, and it was time to splurge on a few things (a three-figure splurge, not a four-figure splurge) because I am almost 40 and I've only ever purchased one piece of new furniture. The main thing we went to get was OUT OF STOCK, even though I'd checked a few days prior and they had plenty. Maybe everyone in the vicinity went to buy their kids bunk beds over spring break??? We chose an alternative bunk because we'd already rented a truck, and we only go to IKEA once every 10 years. We didn't stray far from the list, which I think is pretty impressive. Friend with a truck again!!! But just a rental. Today I want to talk about house concerts -- again. I've had a few people tell me they would love to host, but they don't think their house is large enough. I want to encourage you to re-think that! I live in a classic Highlands' house (if you know Louisville, you can picture the type -- Dutch Colonial, no closets, small kitchen, etc.) The whole house is maybe 1450 square feet, and it's never been "opened up," as they say on HGTV. But if you move furniture out of the living room, it can easily fit 20-25 people and still have room for two musicians in a corner. Think four rows of 5-6 folding chairs? Or picnic-style on the floor? 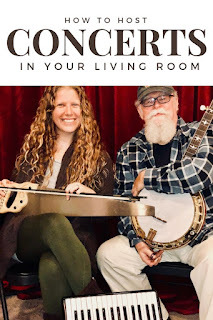 The whole point of house concerts is to create a cozy, intimate "venue" that is nothing like traditional venues -- it's a place where the artist is in-your-face and accessible. If you've already decided you're ready to host, click here for a shorter Step-by-Step! House Concerts are my favorite kind of performance, both as an artist and as an audience member. They can vary based on the host and space, so these are not hard-and-fast rules — just a general idea. feature a “suggested donation” by each attendee, generally between $10-20/person, which goes directly to the musician. include some snacks, but are often potluck. are most often BYOB, though some hosts choose to provide beer & wine. Your living room is generally the best location. Move out large furniture and bring in every chair in the house — or clear out all furniture and encourage people to cozy up on the floor. Outside/your deck is another great choice, but be sure to have a rain plan. 7:00 Guests begin to arrive. Mingle with host and artist. Cocktails and snacks are consumed — potluck events are nice, but some hosts like to provide their own munchies. 8:00 Host announces that the concert will begin soon, and people should find their way to the living room and make themselves comfortable. 10:00-10:30 Everyone hangs out, artists sells some CDs, jolly good time had by all. 10:30-11:00 people trickle out and go home. What’s in it for the guests? A better experience than a traditional venue where you pay a cover charge, buy the pub’s overpriced beer, and watch a musician up on a big stage with bright lights. House concerts are unique. You’ll hear stories and be able to interact with the artist in ways you couldn’t at a venue. You’ll be able to request songs, ask questions about songs, and get up close and personal with the artists. Since most hosts don’t want a bunch of strangers from the musician’s mailing list in their homes, it’s up to the host to invite people. Word of mouth is everything. Most people create a Facebook event, sharing music and videos to entice their friends. Get excited about the event, and let your friends know how fun, intimate and Instagram-worthy it will be. 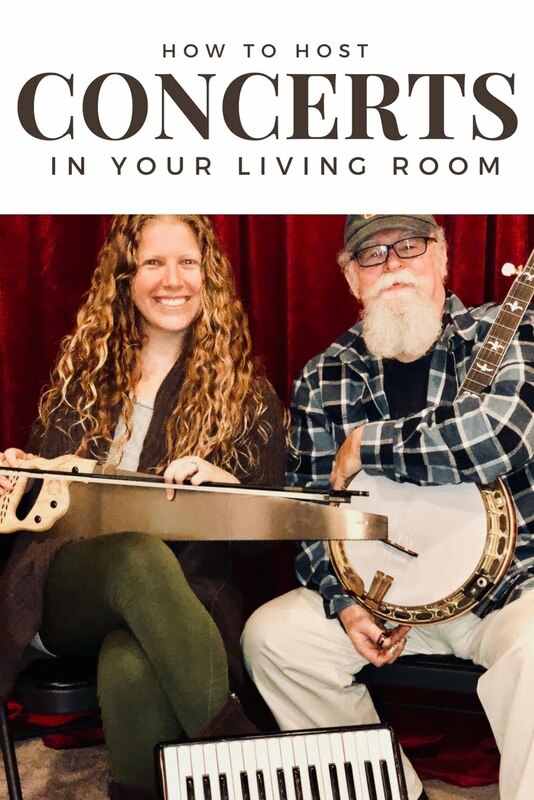 Most people have never been to a house concert, so share with them what to expect and how much you have enjoyed previous house concerts. The idea of interacting with a professional musician on a personal level — from shouting song requests to potentially jamming with them after — is intriguing. And, yes, I have given many a musical saw lesson after a house concert, and occasionally have even led a showtune singalong on a host’s piano long after the party was supposed to have ended. Keep track of RSVPs, and stay on people who have committed. There is generally a day-of cancellation rate of 20-30%, so you can do what airlines do and overbook — or at least send out more invitations if you are worried about turnout. Make clear on your invitation that there is a donation at the door that goes entirely to the musicians. It is usually in the $10-20/person range, and wording it as a “suggested donation of $20 per person” gets the point across. Money conversations can be awkward, so be as straightforward as possible, letting guests know this isn’t a party where you hired entertainment, but a ‘house concert’ where the artist gets paid from donations. You can collect the donation up front at the door, or send around a hat at the break. Sometimes people get their kids to approach everyone for money. Sliding scales are always an option. Thank you for even considering hosting a house concert! Even if you don’t host one yourself, I encourage you to attend one should you be lucky enough to receive an invite. There is something magical about these events — opportunities to interact with artists, hear stories from the road, brand new songs, half-written songs, stories behind songs, etc.